Decorative Life: Mostly 5-9 days but varies greatly depending on species and cultivar. For example, Faragher et al. (2000) report that 'Newmarracarra' had a 5 day vaselife while 'Mullering Brook' lasted 12 days in the same experiment. Low nitrogen fertilization during production results in poor leaf color and contributes to leaf fall during transit while optimum nitrogen levels can increase vaselife. Depending on species and cultivar, harvest when 25-80% of the flowers are open. Member of the Myrtaceae (myrtle) family. Related species include Eucalyptus, bottlebrush and Leptospermum. Flowers 1/2 inch across, occur along stems with needle-like leaves. Plant is a woody shrub, classed as a dicotyledon, leaves not parallel veined. At 32-34 F, up to 2 weeks, treat with fungicide to prevent Botrytis. The presence of Botrytis during transport can greatly accelerate premature flower fall. Chamelaucium: Greek for dwarf and white. The specific epithet name “uncinatum” means hooked at the point. Often grown in Australia and shipped to the US floral industry. Excellent filler for bouquets. Water stress symptoms often appear on leaves before flowers. 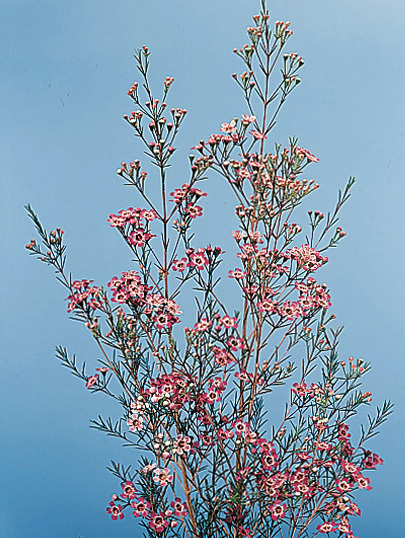 Australia is a major exporter of waxflower and therefore has to meet insect quarantine standards of the importing countries. To meet these standards, Seaton and Joyce (1996) tested 13 insecticide dips and measured their effects on phytotoxicity and flower life. Depending on cultivar and insecticide, vaselife was reduced from 0-49%. Care must therefore be taken before wholesale insecticide treatment of this species is implemented.